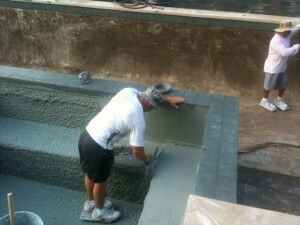 For gunite or concrete pools, plaster is the most desirable finish. It comes in several forms and a multitude of color choices. When applied properly, and barring underlying structural problems, plaster provides a barrier between the structure of the pool and the water in which you swim. A standard question customers ask is, “How do I know when it is time to re-plaster my pool?” The answer is both subjective and objective. Three questions will help you make this important decision. DO YOU EXPERIENCE WATER LOSS OR SEE AREAS OF DELAMINATION? Water loss can occur based on any number of problems, but in this case, let us focus on a few specific issues. First, cracks in a swimming pool structure can show up through the plaster surface. We will make recommendations regarding cracks on a case-by-case basis. Also, water can leak through many of the penetration points around a pool (pool return inlets, light fixtures, etc). If your pool is losing water from somewhere other than plumbing, resurfacing may be a viable solution combined with other work. Delamination is an industry term that simply means the plaster is separating from the surface beneath it. This occurs because of inadequate preparation prior to resurfacing. We use the plaster manufacturers’ recommended product and procedure for preparation, which usually protects against delamination. If you are experiencing either water loss or delamination, we can recommend a course of action suitable for your specific situation. IS YOUR SURFACE SO ROUGH THAT IT HURTS SWIMMERS’ FEET? As plaster ages, or because of improper chemistry, its surface becomes rough via etching or scaling. When the pain on the feet is unbearable, it may be time to consider re-plastering. Our typical method of “start-up” (care for the first several days of plaster life) allows for a smooth-but-not-slick surface designed to add years of life to the plaster and make for a comfortable swim experience. DO YOU LIKE THE CURRENT LOOK OF YOUR POOL? Whether the previous plaster choice was not your style or the surface and water chemistry were not properly maintained, aesthetic appeal is the final reason to resurface your pool. Consider your pool a blank canvas on which you can, within reason, customize the look of your pool. Contact us today to speak with a renovation specialist about Diamond Brite® Quartz Aggregate finishes, one among a wide variety of beautiful and resilient options that may suit your taste in color, style, and overall cohesion with the rest of your outdoor living space.